Ted Mahsun: Short Story Progress Report (August 2015). Earlier this year I blogged about feeling inspired to write again, how I gained my writing mojo back after several years of writing drought. As I said it that blog post, I intended 2015 to be the year I took writing seriously again, and so far, I've stuck to my word. I didn't mention it back then (perhaps because I was afraid of jinxing it) but I renewed an old contract, an old resolution I used to make every end of the year, and that was promising myself I'd write a short story a month, or twelve stories a year. I've never been able to keep that promise and at the end of the year, I'd self-flagellate for not being able to live up to that promise. But this year felt different. There was certainly something in the air, and I was determined to seize this newfound optimism and channel it into my writing. And boy, have I been productive. Still not quite living up to that promise, but it's much better progress than years past. Do Djinn Dream of Burning Sheep? Out of all these stories, one has been self-published (The Dangers of Growing Air-Cooled Volkswagens in Your Backyard), two have been accepted for publishing (Mastura's Air Lengkong Adventure in Hungry in Ipoh and The Ghost in the Garden in Griffith Review 49: New Asia Now Vol. 2) and the rest of the completed stories are in process of submission in various places. Out of all these stories, Under a Concrete Sky the Flashing Lights Zoom By is by far my longest story. At 10,600 words, it's a novelette rather than a short and it's one I'm quite proud of. It's been rejected by four pro markets so far but I hope it'll find a home soon. Do Djinn Dream of Burning Sheep? was initially a 1000 word flash fiction sent to Daily Science Fiction but after getting rejected, I rewrote it significantly, expanding it to about 2000 words and now it's waiting for a response from Fixi Novo for their HEAT anthology. And the Heavens Your Canopy is funny little thing that just popped into my head over the period of a week after I completed writing Concrete Sky, which was ridiculously hard to write. Heavens was in stark contrast, a relaxing walk in the park. 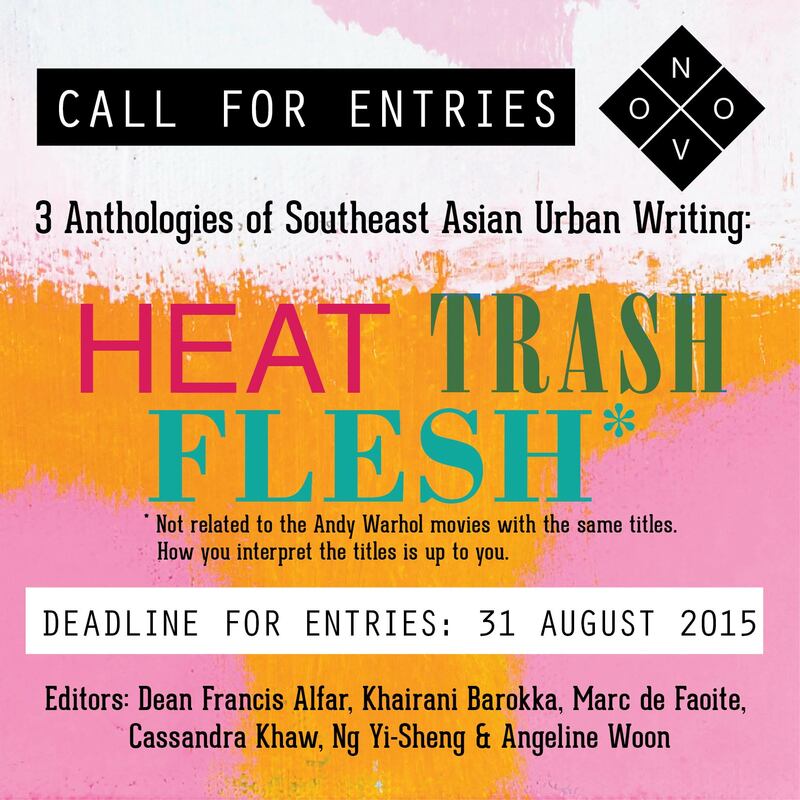 This story is now waiting a response from Fixi Novo for the TRASH anthology. I started writing Air-Cooled Nuisance as a riff on Disney's old Herbie movies, intended as flash fiction for Daily Science Fiction, but the story quickly grew more than 1000 words. I'm still not sure where the story needs to go, so it's been put on the backburner for now. Girl at Salak Selatan was written in response to Daphne Lee's call for submissions for her Remang horror story anthology. While writing this I came to the realisation that I don't like horror stories and even less of writing it, so I abandoned it. There's still 500 words of that story that I could probably reuse for something not-horror but it'll probably be a while before I revisit it. Say, I Seek Refuge with the Lord of the Dawn is still under progress. It's my current writing project and it takes place in the same world I created for What the Andromaid Reads at Night (the short story that got published in Zen Cho's Cyberpunk: Malaysia) and my novelette, Concrete Sky. It's been another tough story to write, but I'm enjoying the process so I'm willing to put the hours in to make it a great story. It's August, so I should have had eight completed stories now, and I only have five. I'm a little behind but I think what I have so far is still good progress. I'm just happy I'm this passionate about writing again. There's still four months left in the year, and who knows, maybe I suddenly become super prolific and be able to crank out another seven stories? If Ray Bradbury was able to push out a story a week, I don't see why I can't do it every month. With that, I leave you with this io9 article I recently rediscovered: 12 Secrets to Being a Super-Prolific Short-Story Writer.